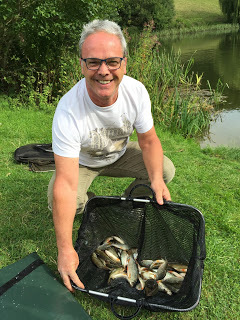 After the last match here where I sneaked a win on the pole in bright and sunny conditions, this week it was fairly overcast and I thought bream and skimmers would probably win it today, so I made sure I had my feeder rod and a reel thingy with me again today. I got to the draw at the Oak and along with the regulars it was nice to see a new face as Nick Payne was fishing with us today. After a sausage sarnie and coffee it was time to draw, I got into the hat with only a few pegs left and pulled out peg 13 on the bottom bank which I was fairly happy with. I got out the pond and it was flat calm which I didn’t think would do us any favours today, first job was to mix up some Bait-Tech Pro Nat Bream before setting up a feeder rod with a cage feeder and 0.12mm hooklength to a size 16 B911 with a hair rigged band. I set up a Preston Chianti to fish shallow and was going to set up a depth rig as well but ran out of time. Robin blew for the start and I started on the feeder with a 8mm pellet in the band and cast out to the clip, I didn’t leave it out long and had a few casts to get some feed down and also started feeding casters and hemp at 10 metres and another line at 8.5 metres by the reeds to my left. To be honest the first hour was a complete anti-climax for me with just a few knocks on the tip, Big Frank in peg 10 on my right fared considerably better with a lovely 2lb tench, a decent bream and a couple of skimmers for probably the best part of 10lb!. I’d seen Jake up on peg 6 land a couple of skimmers and Fieldy across in peg 19 was fishing his usual two sections to hand and catching loads of small fish and I heard him tell Rob he’d had 74 fish in the first hour. 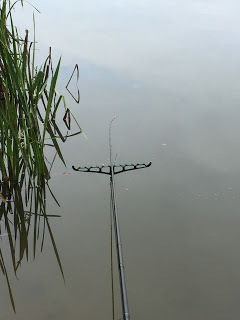 So already I felt like I was too far behind Fieldy to compete on the pole so stayed on the feeder hoping some bream or skimmers would put in an appearance. I scaled down my hook bait from a 8mm pellet to a 6mm in a bid to try and get some bites, it worked to a certain extent as the next chuck I had a 6oz roach and then had a little tench of a similar size but I was going nowhere fast and after an hour and a half I didn’t have a pound in the net yet! With boredom setting in I had a look on the pole line but it wasn’t really happening there either and it was really hard work. 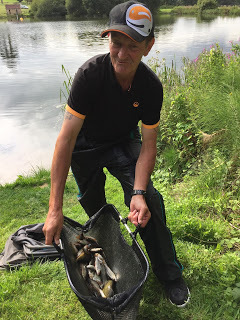 I did manage to catch some chunky perch up to 4oz from my shorter pole line by the reeds and when Andy Welch turned up for a walk round and said the odd skimmer was being caught but nobody was really bagging, I decided to stick with the pole for now. By swapping between my two pole lines I was getting odd roach but just couldn’t catch any quality despite some good fish swirling for my casters. 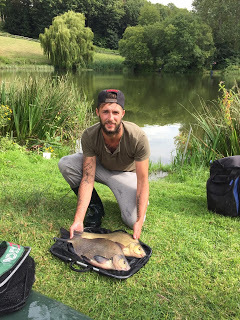 Frank and Jake were still getting the odd skimmer and I just didn’t know what to do next, I had another quick look on the feeder but only managed another small tench so it was back on the pole. It was looking like Jake, Frank and Fieldy would all frame so my best chance of a pick up would be a default section win and I decided to stick with the pole for the rest of the match. Around the half way point I hooked what felt like a much better roach or rudd but of course the hook pulled out and then I tried double red maggot and bumped a better fish and I started to sense it wasn’t going to be my day. I was getting loads of bites on caster but just couldn’t hit them, there were still big roach and rudd swirling for my feed but they were crafty fish, I tried altering depths, moving all the shot up the line, laying the rig in and holding it tight, flicking the rig past the feed, adding another section but nothing really helped, I’d get odd roach but none of the quality fish I knew were there. I wasn’t too upset when Rob blew for the all out, I finished with 62 fish which I thought would go 4-5lb and it had been a very frustrating day. 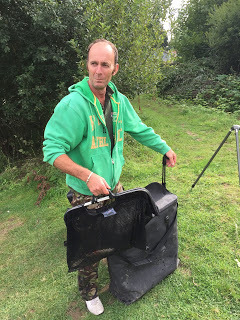 I packed up and walked up with Steve to start the weigh in at peg 4, Nick had struggled a bit for 1lb 1oz before Jake had two nice bream and some skimmers for 20lb 1oz from peg 6, Terry had 5lb 12oz in peg 8 and then Frank had a lovely net of fish and just pipped his boy to go into the lead with 20lb 14oz. I weighed 5lb 13oz but any chance of a section win disappeared when Steve had 8lb 2oz and took a nugget off me as well (and he didn’t want a side bet to start with!). 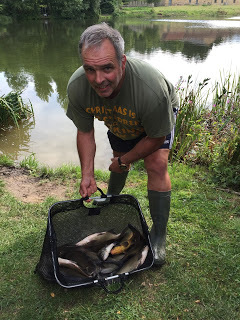 But at the results and Fieldy had the top weight in the other section and finished third with over 300 fish for 17lb 13oz from peg 19, followed by Stu Alford with 12lb 7oz, Rob with 10lb 14oz, Baz with 10lb 6oz and Bob had struggled in 24 for 13oz. In hindsight if I’d have fished the pole all day I’d have done enough to win the section but at the moment the feeder is winning most of the matches so I wasted too much time trying to catch bream and skimmers. I do think you need to be very single minded here, Fieldy just gets his head down fishing for bits and he’s framing most weeks and Frank and Jake both fish the feeder and are nearly always there or thereabouts, whereas I keep swapping and changing and ending up in no man’s land. The problem with the feeder is, that if you don’t catch in the first hour, you are already several pounds behind the pole/whip anglers so it’s pointless switching to try and catch them up so your hand is somewhat forced to stay on the feeder. If you catch on the feeder quite quickly like Frank and Jake did today, you can stay on it as long as you’re catching and you still have the option to swap to the pole. 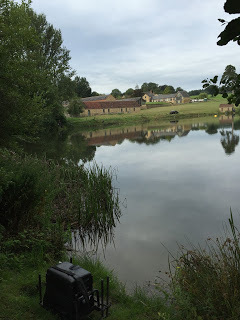 It’s certainly an intriguing venue and so far there have been eight matches with a different angler winning each time which keeps things interesting. So after a good run of results, I got it badly wrong today and at times I didn’t know whether I was coming or going, now where’s the nearest chippie! After eight matches and dropping the worst two results, Fieldy leads with 8 points followed by Stu Alford on 10 and Frank on 11.